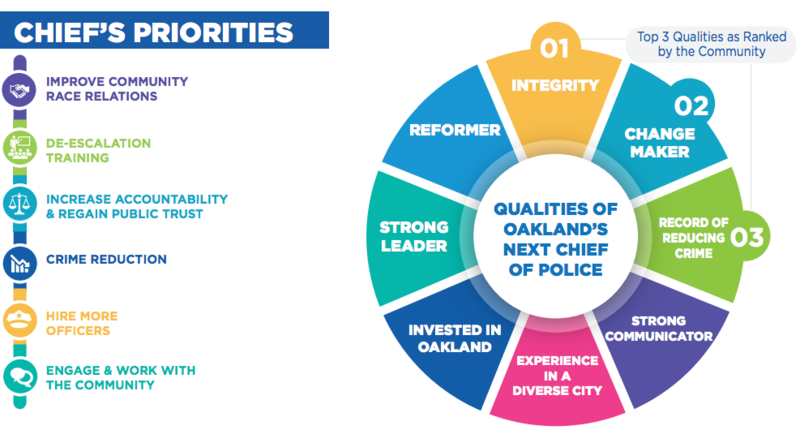 According to the results of a newly released city survey, Oakland residents want a "thick skinned" police chief who can "end corruption in the Department" and "display high moral standards and integrity." Three Oakland police chiefs were forced out earlier this year when a scandal involving the sexual exploitation of a seventeen-year-old woman by multiple Oakland cops was unearthed. Since then, the department has been without a top cop. 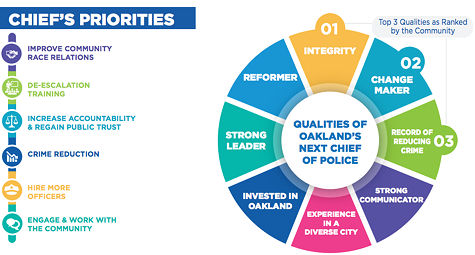 Oakland Mayor Libby Schaaf and City Administrator Sabrina Landreth commissioned the survey as part of a larger effort to gain community input on who they should hire to lead OPD. "It is essential that the public has a genuine opportunity to develop the roadmap for how they expect the Police Department to move forward under new leadership and that they are kept abreast of the process at each key step," Schaaf said in a press statement issued earlier today. The survey was taken by 638 people, 92 percent of them Oakland residents, and 55 percent of them with jobs in Oakland. The results, posted on the city's web site, show that Oakland residents want a more accountable department, but they also want increased police services. Responds said they want to see more officers walking their beats, rather than cruising in patrol vehicles, and that the police should improve their response times to all types of reported crime. They also said OPD should hire more officers, something the department says is necessary in order to improve response times. Respondents also want a chief who will prioritize deescalation tactics among officers, especially when they're responding to calls involving someone having a mental health crisis. But by far the top response was that the new chief needs to be someone who can "lead cultural change" in the department.